For throwing plugs at bluefish, we recommend a spinning rod and reel combo suitable for 20-30lb fused line. The optimal rod is 7′ feet long with a fast to extra-fast action and capable of handling lure weights up to 1 ounce (though you typically throw lures 50% heavier than the rating). Most anglers prefer to use 30lb fused line (as opposed to 20lb fused line) because the slightly increased line diameter does not noticeably affect casting distance. For bluefish plugging, we recommend loading the reel with 30lb fused line as opposed to braided line or mono. Fused and braided lines allow for much greater casting distance than mono. This is because is the much smaller line diameter of fused and braided lines. In addition, the fused and braided lines have virtually no stretch which allows the angler to carefully work even the most difficult lures, and easily set the hook. Fused line is preferred to braided line because it has better abrasion resistance and is less likely to form a wind knot. The line should be attached to a 3ft length of 50-8olb fluorocarbon leader using a 75lb barrel swivel. The small profile of the swivel virtually eliminates any chance of picking up debris and provides an easy connection point between the line and the leader. The angler needs to be careful not to reel the swivel into the rod as it can damage the guides. Some anglers use an albright or uni-knot instead of a swivel. This knot can be tricky to tie properly with braided and fused lines. We do not recommend using wire leaders for bluefish plugs. The lure bodies are typically all the protection that is needed. The wire leaders harm the action of all but the biggest lures. As with any popping lure the angler should always experiment with different retrieval speeds. If a fish strikes at the lure and misses be sure to pause for a moment to give the fish a chance to gather itself before it strikes again. Different lures will be effective at different retrieval speeds. When targeting bluefish on poppers, lures that work well at slow speeds are typically preferred. Another common mistake is that the fish strikes the lure, hooks itself, and the angler just starts fighting the fish without ever setting the hook. Bluefish often jump and thrash on the surface. They can easily unhook themselves. Remember to set the hook! Unless you are fishing in a tournament you should always crush the barbs on all treble hooks. By crushing the barbs you minimize any damage that might be done to the fish. Even more importantly, most angler/hook accidents occur when plugging. 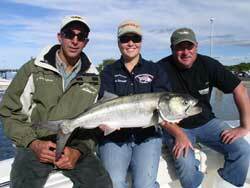 Smaller bluefish are easy to bring to the boat and are typically green (very lively). It doesn’t take much of a head shake or a slip while holding them to end up getting hooked. It can be very difficult to remove a barbed hook from an angler especially when it is attached to an angry bluefish.